Sarah Bjorknas of Vancouver Catholic Worker House and War Resisters Support dealt with difficult roadways, sidewalks, tree-overhangs, and traffic congestion as she pushed the Torch from New West to Metrotown. But she waved at supportive honkers and at the CTV camera guy who followed us the whole way.Bob and Judy Doll assumed the Torch at Metrotown. After some negotiations with a Metrotown manager, volunteers were given permission to carry on leafleting and playing Slapshots to End Poverty. An eagle looked down on all the activity at Metrotown and seemed to approve. 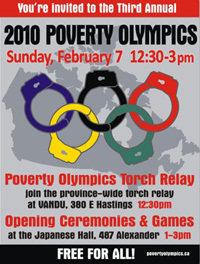 The Burnaby Now ran a story on the torch relay highlighting Burnaby’s shocking rate of poverty - 25.5%, one of the highest in the province.